Our New Year’s Eve plans changed at the last minute, and as it was an unusually cold and wintry day in Southern California (even rain! 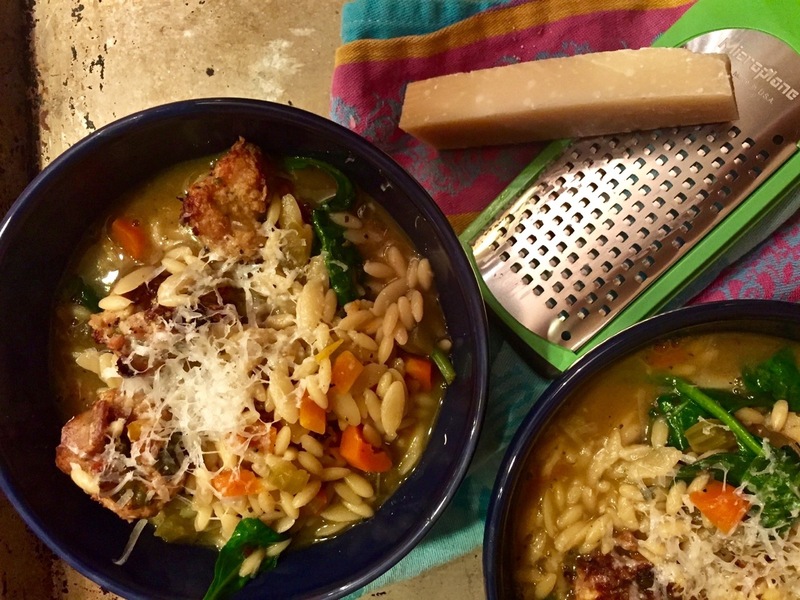 ), I turned to my favorite cookbook author, Ina Garten, to make her Italian Wedding Soup. I have made this on numerous occasions and always change it up. My favorite is to use spicy Italian chicken sausage in the meatballs, pancetta to sauté the veggies, and orzo for my pasta. If you’re like me and don’t have homemade stock on hand, a little trick I like to use is to add 1 t. Better Than Bouillon (reduced sodium) to each cup of chicken broth. It enhances the chicken flavor. 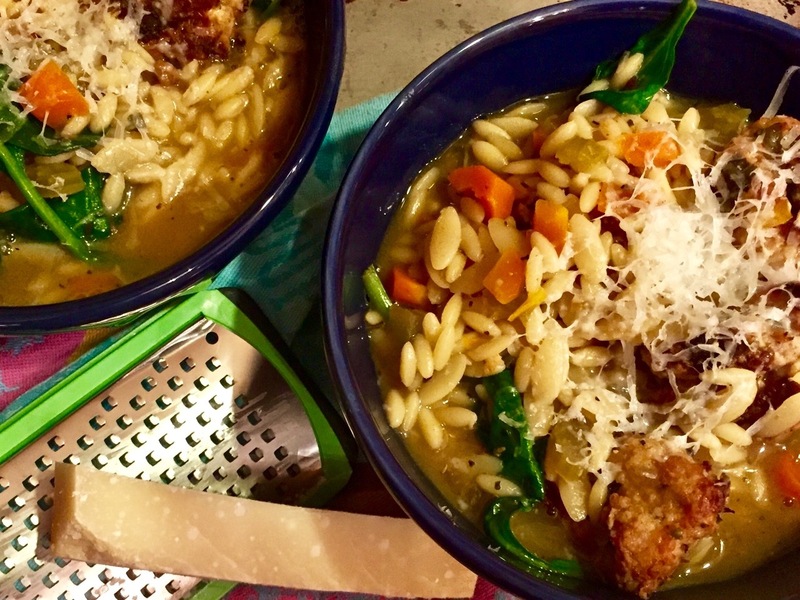 We think the combination of veggies sautéed with pancetta boosts the richness of this soup. I also throw in some herbs de Provence with the sautéed veggies instead of the dill that Ina recommends. I love the Herbes de Provence from Hediard in Paris but was excited to see herbs de Provence are now available at Trader Joe’s. Their version has lavender instead of anise, and it’s a much better combination. A couple of small tweaks and we have a hot steaming soup on a cold winter’s eve. Delicioso! For the meatballs, combine all the ingredients in a bowl and gently combine with a fork (or your hands). 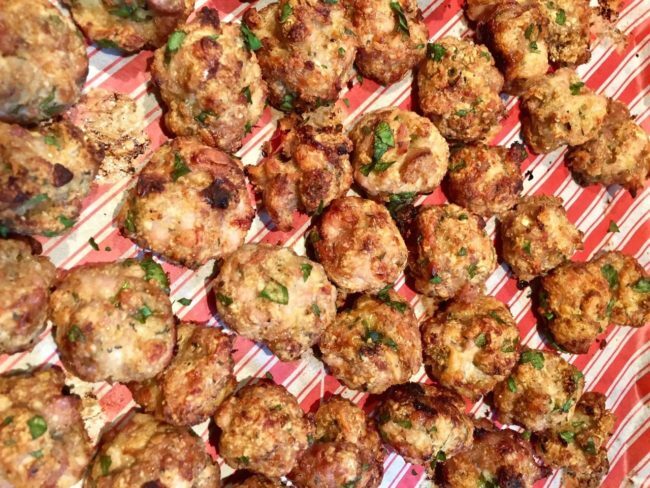 With a teaspoon, drop 1 inch meatballs onto a baking sheet lined with parchment paper. Bake for 30 minutes until cooked through and lightly browned. Makes about 40. Set aside (and don’t eat too many). In the meantime, for the soup, heat the pancetta or bacon over medium-low heat in a large, heavy-bottomed soup pot. Once the pancetta is almost cooked (don’t let it get crispy), add the onion, carrots, celery, and herbes de Provence and saute until softened, about 5-6 minutes, stirring occasionally. Add the chicken broth and wine and bring to a boil. Add the orzo to the broth and cook for 6 to 8 minutes until the orzo is al dente. Then add the meatballs back into the soup and simmer until heated through. Stir in the spinach and cook until just wilted. If the soup thickens too much as it sits, add water or chicken stock to thin. 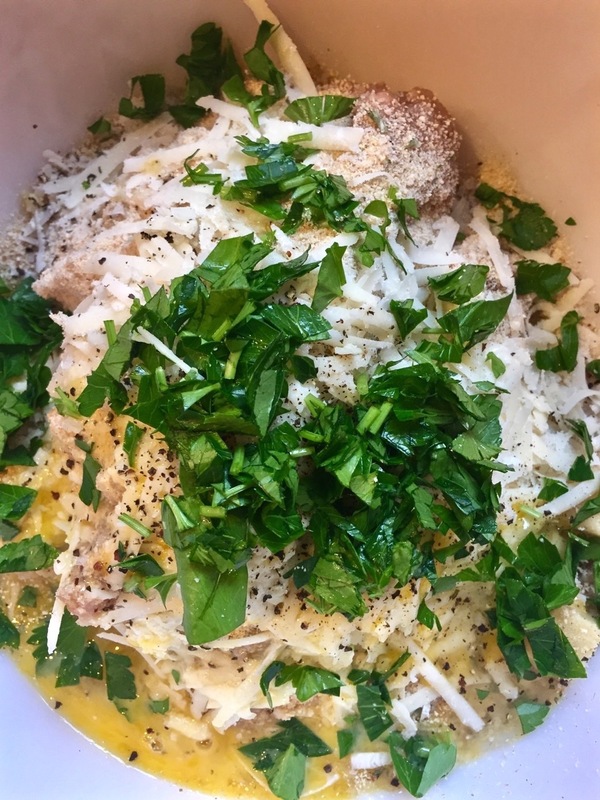 Ladle into soup bowls and sprinkle with extra grated cheese.